By the end of 1914 World War I had settled down to a static if bloody business of opposing trenches resembling a two-sided siege on a huge scale and this relatively new type of warfare brought into use a whole host of new weapons; some of these, like mortars and grenades, were simply modernized versions of long obsolete items, but some were genuinely new. and the submachine gun comes into this latter category. The first to appear on the actual battlefield was the Italian Villa Perosa of 1915. This was, however, rather complex and in spite of its obvious potential it does not seem to have made any great impression. The Germans soon began to arm a proportion of their infantry with stocked pistols of the Mauser and Luger type (both of which are dealt with elsewhere in this book), and it was a short step to the introduction of a somewhat heavier version with the capacity to fire bursts. Work on a prototype weapon started in 1916 at the Bergmann factory, the designer being Hugo Schmeisser, the famous son of an almost equally famous father, and by the early months of 1918 it was in limited production. The Germans, always realists, appreciated that at that late stage of the war, when their manufacturing capacity was fully extended, any new weapon would have to be simple to make and the MP 18.1 fulfilled that requirement. The techniques of mass production by the use of pressings, spot welding, and pinning were, however, hardly developed so that simple' is a relative term when compared with, say, the Sten gun of a quarter of a century later. The Bergmann was machined, and although elaborate milling had necessarily been abandoned, its general finish was relatively good. Its weakest component was its magazine, which was a of a type originally developed for the Luger pistol, and which was too complex and liable to stoppage to be fully reliable. The Germans proposed to have six guns per company; each was to have a number two to carry ammunition, and there were to be three hand carts in addition, which presupposed a type of barrage fire, but it came too late. Its main interest is therefore its influence on future design, which was very significant. 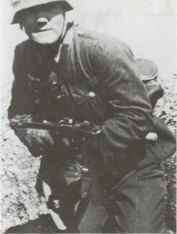 Above: German soldier advances with his 9mm Berg ma nn MP28.II sub-machine gun. 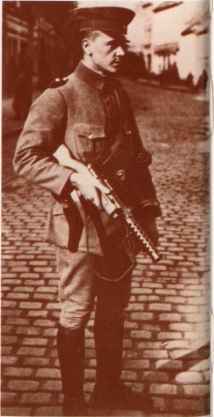 The MP 18.1 issued to the German police for internal security purposes in 1919 had been slightly modified by Schmeisser in the light of practical experience in the previous year. The chief change was a new magazine housing designed to take a straight box magazine of modern type rather than the complex clockwork-operated snail drum which had given a good deal of trouble in the conditions of trench warfare. 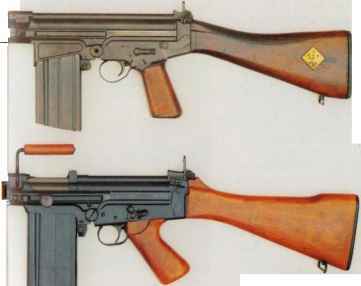 A few years later the same designer made even more improvements, and as these were sufficient to warrant a new designation the modified MP 18.1 appeared in 1928 as the MP 28.II, the II denoting two minor modifications to the prototype. The new gun had some interesting features, chief of which was its ability to fire either bursts or single shots as required. This was controlled by a circular stud above the trigger, which had to be pushed in from the right for automatic, and from the left for single shots. The gun also incorporated an elaborate tangent backsight graduated by hundreds up to a thousand metres, which must have been far outside any practical service range. It was equipped with straight box magazines, but the magazine housing was so designed that it would if necessary accept the old snail drum type. These various •improvements did not change its general appearance very materially so that it still resembled the old MP 18. The Bergmann MP 28.11 was produced in Germany by the Haenel Weapon Factory at Suhl, but as there were still some restrictions on domestic production of military firearms a great many more were produced under Schmeisser licence by a Belgian company in Herstal, and it was adopted by the Belgian army in small numbers in 1934. The Bergmann soon established a reputation for reliability and was purchased in South America [where it was extensively used in a series of small wars there) and by the Portuguese who used it as a police weapon. Although it was mainly manufactured in 9mm Parabellum, it also appeared in 9mm Bergmann, 7-65mm Parabellum, 7-63mm, and even for the American 45" cartridge. It seems probable that its main use was in the Spanish Civil War of 1936-39, where its robust construction made it an ideal weapon for the militias by whom the war was mainly fought. It ceased to be made before World War II, but had a revival in the shape of the British Lanchester.